My ears have a tender spot for instrumental projects. In the absence of lyrics and mindless ad libs, a measure of aural solace can be found in the wordless grooves and beats found on instrumental projects such as New York producer Eb7#9's new album, Dropped Science. Drawing on the music of his Stones Throw and Brainfeeder heroes Madlib, Jonwayne and Flying Lotus among others, and bands such as Radiohead, Stereolab, and The Beatles as a source of inspiration, for Dropped Science Eb7#9 brings together a collection of synths, basslines and percussion to give beat loving enthusiasts a collection of seventeen replay-worthy instrumentals. Not to be mistaken for a beat tape, Eb7#9's is fully realized lo-fi electronic hip-hop project which showcases the young beatmsith's keen attention to detail and ear for unique sounds. Made with the goal of striking a harmonious balance between "synth driven hip-hop" and non-hip-hop Eb7#9's is a textbook study in sample-based hip-hop production. 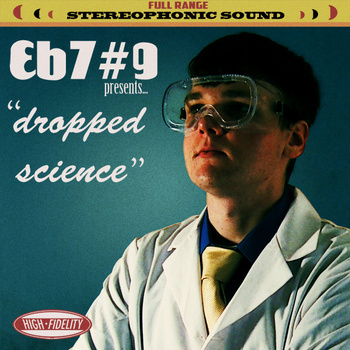 Stream several tracks taken off the album above and follow the links to grab a digital copy of EB7#9's Dropped Science, which is available now for $7 via his Bandcamp page.